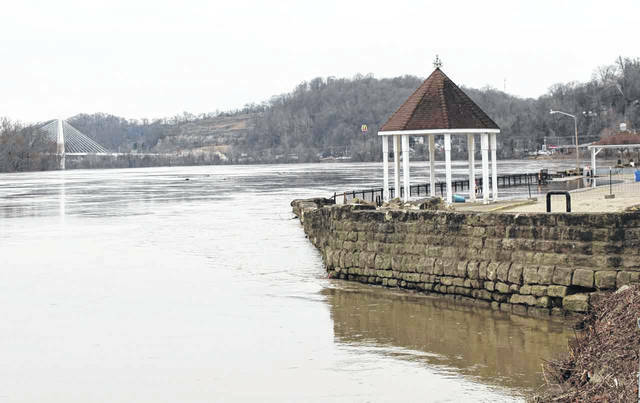 The Ohio River revisits the parking lot wall and upper gazebo in Pomeroy. The R.C. Byrd Locks and Dam on Monday morning. Water in “the dip” of the parking lot in Pomeroy. A view from Main Street in Pomeroy from Mason, W.Va.
Water approaches Ohio 7 on Monday morning just north of Crown City. The water creeps into the Butler Wilderness Area south of Gallipolis on Ohio 7 on Monday. OHIO VALLEY — Here we go again. 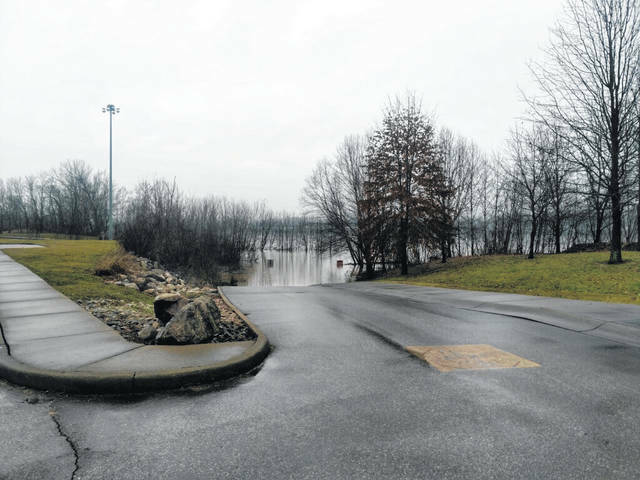 After high water crested at locations from Belleville to R.C. Byrd over this past weekend, the latest river crest forecasts are projecting the Ohio will move into flood stage later this week. The latest projections show the river reaching above flood stage in Belleville, Racine, Pomeroy, Point Pleasant and nearly at flood stage at R.C. Byrd Locks and Dam. 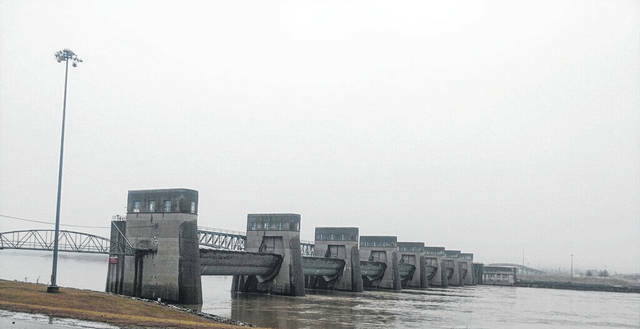 Belleville Locks and Dam, crest is predicted at 37.8 feet on Thursday, after cresting at 36.45 feet this past weekend. Flood stage is at 35 feet. At Belleville, at 34 feet, water begins to cover Ohio 124 at the mouth of Laucks Run, north of Portland; at 35 feet, Ohio 124 is flooded north of Stiversville Road, at Rock Run, at Wells Run to Smith Ridge to Dewitts Run, at Forked Run, at Curtis Hollow Road and between Long Bottom and Shade River. Ohio State Route 124 near the Washington and Meigs county line, also experiences flooding. For reference, at 38 feet, Route 124 towards Racine is flooded. Sections of Ohio State Route 248 at Sand Hill are flooded. Racine Locks and Dam, crest is predicted at 43.8 feet on Thursday, after cresting at 40.38 feet this past weekend. Flood stage is 41 feet at Racine. At 41 feet, Ohio 124 at Antiquity starts to flood. Areas of Ravenswood are flooded upstream from Racine Lock. With a crest near 42 feet, Ohio 124 at Minersville is flooded. For reference, at 44 feet, West Virginia Route 62 is flooded just below Racine Lock at West Creek. More areas along Ohio Route 124 are flooded. Pomeroy is estimated to crest at 47.4 feet on Thursday, after cresting at 43 this past weekend. Flood stage is 46 feet. In Pomeroy, at 42 feet, the low spot in the parking lot is flooded near the boat ramp. 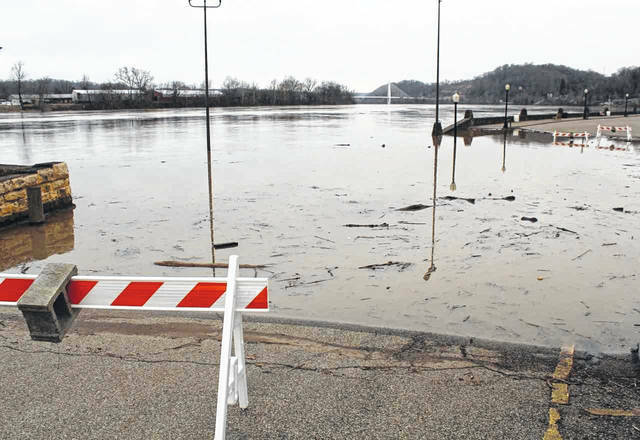 At 46 feet, the Pomeroy parking lots and the river amphitheater are flooded along the river. Main street starts to flood. Some secondary roads are flooded due to backwater. For reference, at 48 feet, businesses along the river in Pomeroy start to flood. Main street is flooded. Homes near the Pomeroy-Mason bridge on the West Virginia side start to flood. 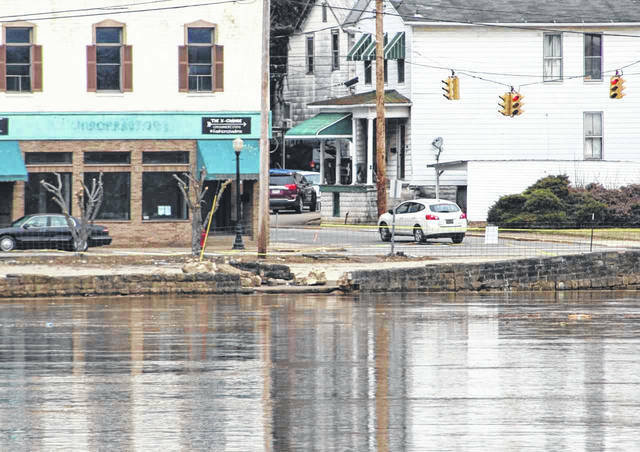 At Point Pleasant, the crest is predicted at 43.9 feet on Friday, after cresting at 39.66 feet this past weekend. Flood stage is 40 feet. At 40 feet, low lying areas surrounding Point Pleasant and vicinity are flooded due to backwater. Also, the amphitheater lower pier is flooded and half way up the steps. Salt Creek Road, Hannan Trace Road, Huntington Road at Boggs Run Road and Mason Eighty Road start to flood. 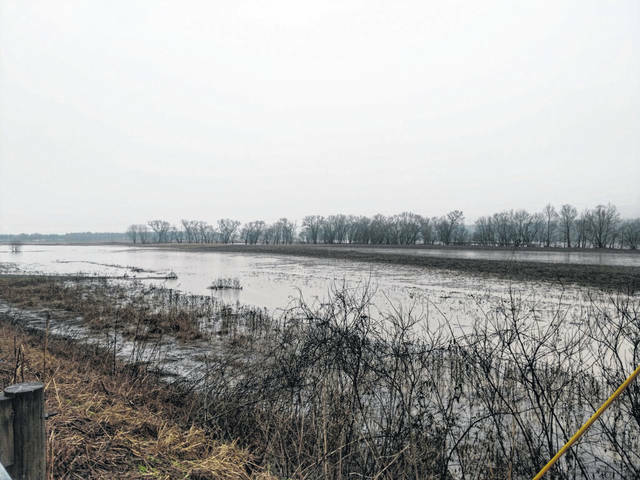 At 41 feet, the Addison, Blaville Road in Ohio is flooded and low lying areas surrounding Point Pleasant and vicinity are flooded due to backwater. At 42 feet, the Little Kyger Road in Ohio is flooded. at 43 feet, Ohio Route 7 at Kyger Creek and Addison is flooded. at 43.5 feet, Route 33 at West Creek and Brinker Run between Vanadium and Letart is flooded. Sand Hill Road near Letart is flooded. At 43.75 feet, Route 30, and 62 near Rockcastle Creek, and Ambrosia is flooded. At 43.8 feet, water crosses Route 21, and 6 at Eight Mile Creek above Ambrosia. For reference, at 44 feet, homes at the end of 2nd Street outside the flood wall in Point Pleasant are flooded. Little Kyger Gravel Hill Road at Kyger Creek is flooded. At R.C. Byrd Locks and Dam at Gallipolis Ferry and Eureka, the crest is predicted at 49.9 feet on Friday, after cresting at 44.47 on Sunday. This put the water barely below flood stage this week, which is 50 feet. At 41 feet, the Spruce Street Chickamauga Creek bridge is closed due to flooding of low areas around the bridge. At 49 feet, sections of Route 7 in Ohio at Teens Run, Chickamauga Creek, Kyger Creek, Clay Chapel, Clay School and just above Route 218 start to flood. Also, sections of Route 2 in West Virginia at Jerry’s Run, the old Coast Guard Station and Glenwood start to flood. For reference, at 50 feet, sections of Route 7 and portions of Gallipolis along the immediate river will flood. Also, bottom lands on the Ohio side of the river are flooded. These river crest predictions, like the weather, are subject to change and Ohio Valley Publishing will continue to monitor any updates.